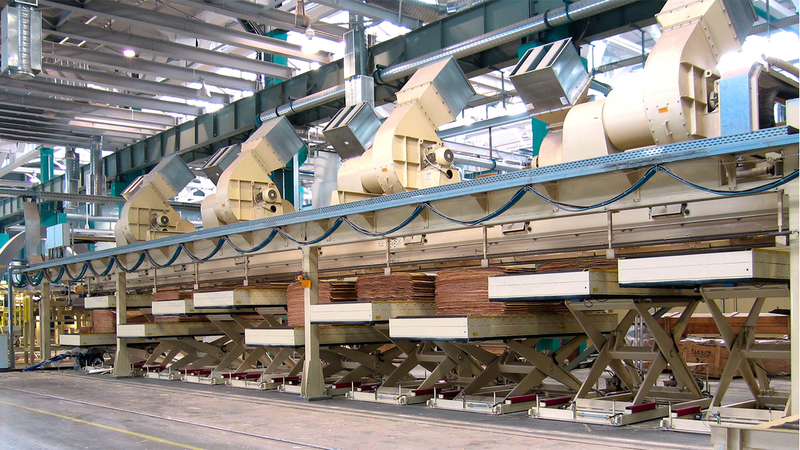 One of the major tasks of modern high-efficiency dryer lines is precise and reliable stacking of large quantities of dried veneers with a minimum of manpower.In combination with the respective dryers, specially adapted unloading systems and the veneer scanner, vacuum stackers are used for this purpose. The stacker systems consist of welded suction boxes with pneumatic downpushers and toothed belt conveyors. With this design a variety of stacking points can be served by a single continuous veneer conveyor. This provides for an optimum stacking accuracy on the lift tables located under the stacker.Different solutions for automatic removal of the veneer stacks and empty-pallet feed are available, tailored to the customers&apos; specific requirements. The individual components of the stacker system are perfectly matched to each other so that even thin and sensitive veneers are stacked in an accurate and reliable manner.The world&apos;s longest stacker system with a length of some 40 m and 15 stacking points comes from Grenzebach.